The good news though is this was (hopefully) the last snowfall for the season and warmer weather will be here for longer than a day or two. 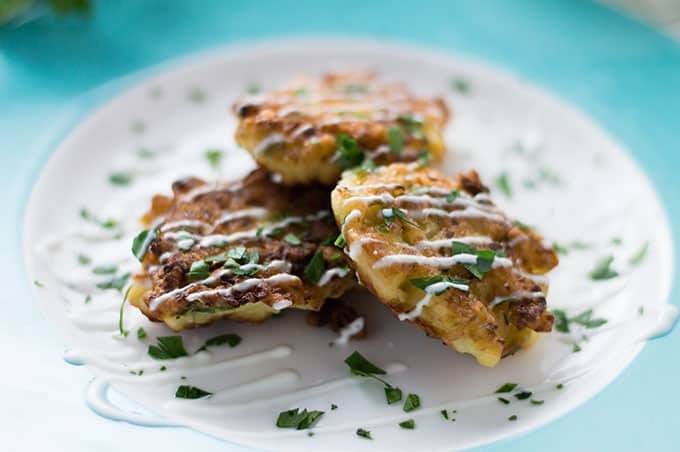 So we’ll consider today’s post of delicious cauliflower fritters a send-off for the dumb, cold weather. Bye Felicia! My love for cauliflower will never end! It’s one of those vegetables we always have in the house, whether it’s a whole head, a bag of florets, fresh or frozen, you name it. We roast it, mash it, make “rice” out of it, turn it into creamy sauces, etc etc. It’s tough for us to get sick of this vegetable because there are so many uses for it. 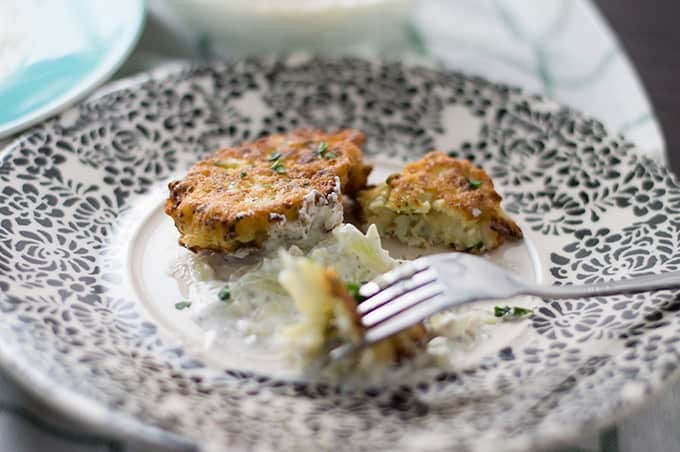 One of my favorite recipes using this vegetables as of lately is cauliflower fritters, also known as kounoupidi tiganites (koo-noo-PEE-thi tee-gha-NEE-tess). Kounoupidi is Greek for cauliflower and tiganito means pancake or flapjack, making tiganites the plural term. 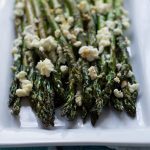 These appetizers are made with simple ingredients and are rather addictive if I say so myself. 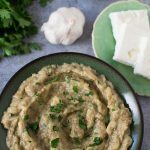 They go really well with tzatziki and I definitely recommend you serve them together. 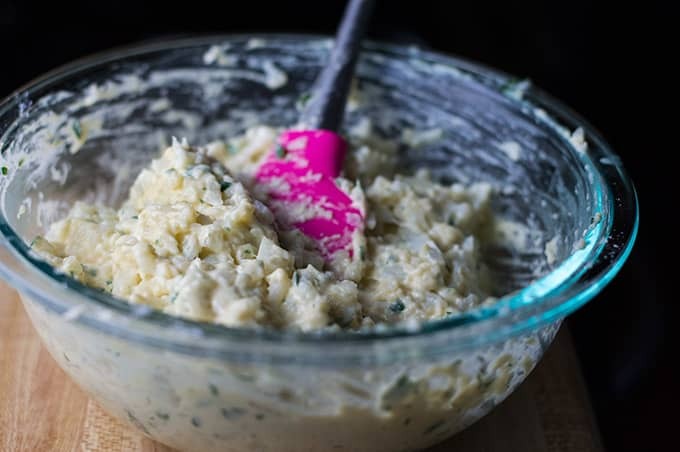 Tzatziki can be made a few days ahead too, so that’s easy peasy. 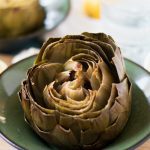 You start by cutting the head of cauliflower into florets and steam it until fork-tender; you want it to be soft, but not mushy. 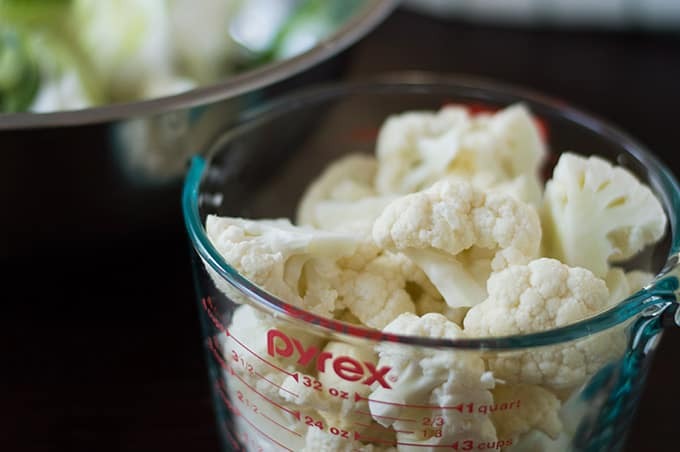 After steaming, remove the cauliflower from the steamer basket and set aside to cool for about ten minutes or so. 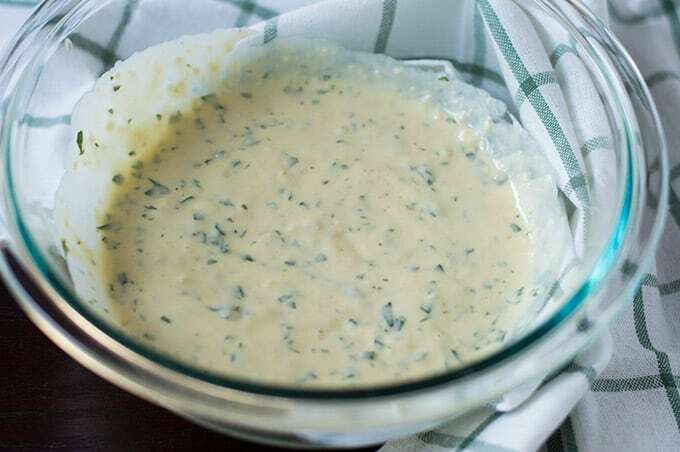 While you’re waiting on it to cool, you make your batter. You’ll use your typical batter staples of flour, milk, salt, and eggs. 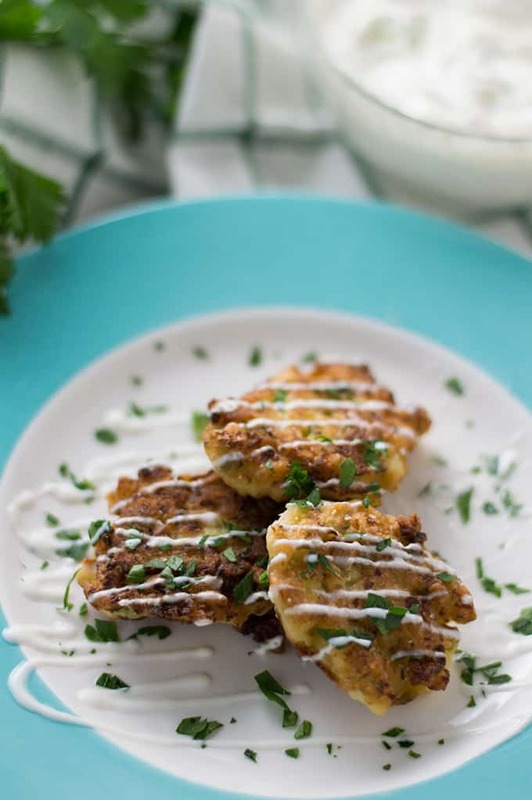 These fritters also have parsley in them and I like to include melted butter in the batter as well; it adds a nice touch. I mean, who doesn’t love butter, right!? 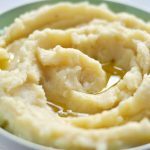 Once the batter is whipped up, you chop up that cauliflower, and fold it into the batter until well combined. For frying these, I highly recommend using a cast iron skillet because they’ll cook up nice and evenly. 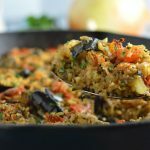 I use my 9-inch skillet for this recipe because you’ll need to add enough olive oil to be about a 1/4 inch deep in the pan; using a larger pan means using more olive oil and that just becomes a bit of a waste in my book. We don’t like wasting ingredients in this house! Start by heating the olive oil in the skillet over medium-high heat and when it’s nice and hot, reduce the heat to medium and drop spoonfuls of batter into the hot oil. I measure about two tablespoons per fritter and cook in batches of four or five. Cook them until they are golden brown, about three to four minutes per side. Use a slotted spoon or spatula to remove them from the pan and place them on paper towel lined plates to absorb extra grease. And if you’d like a little extra salt, sprinkle some over the fritters while they’re hot! Because you’re dropping batter into very hot oil, be mindful of that. You know, don’t put your face up to the skillet, for example? Splatter has been at a minimum when I’ve made these, but that doesn’t mean it never happens. You’ve been warned! This recipe makes twenty fritters if measuring two tablespoons per fritter. If you wanted to make them smaller to serve as an one or two bite hor d’oeuvres, that could also work! Just don’t forget the tzatziki either way. Trust. 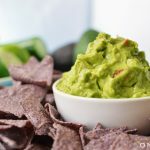 Make these for your next gathering or for those nights when you want to binge on Netflix in pajamas with fried appetizers. 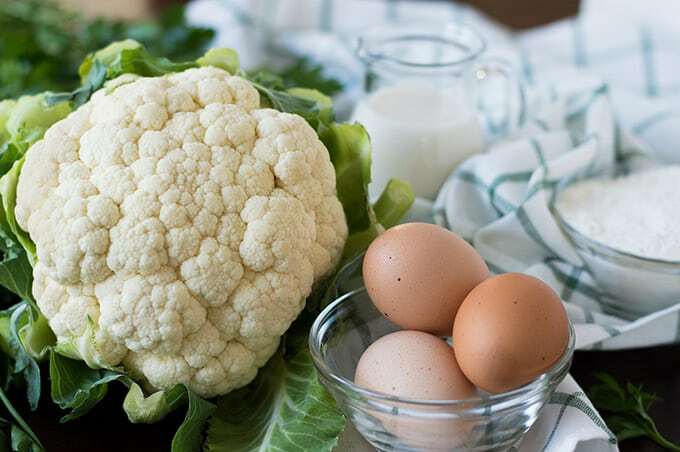 Steam cauliflower until fork-tender (don't let it get mushy). Remove from heat and set aside to cool. In a medium size bowl, beat the egg and whisk in the milk until combined. Gradually add in the flour and salt and continue whisking until a batter is formed. Add parsley and butter and stir until combined. Set aside. 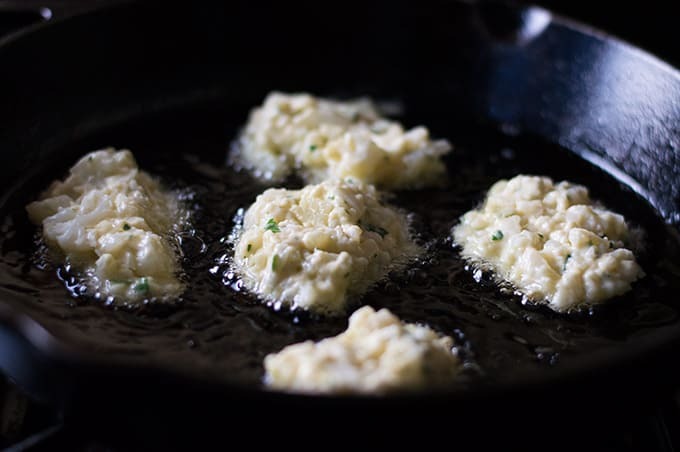 Chop the steamed cauliflower into small bite-sized pieces. Fold the cauliflower into the batter until well combined. Set aside. Pour olive oil into a 9-inch cast iron skillet until it's about a 1/4 inch high. Heat over medium-high heat. 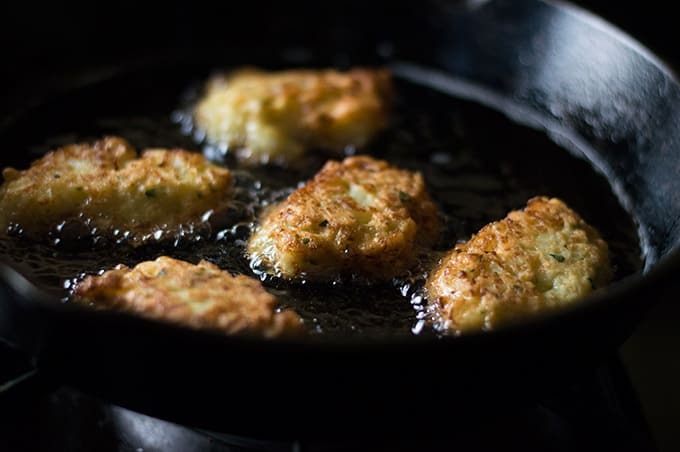 Once the oil is very hot, reduce the heat to medium, and add spoonfuls of the batter (2 tablespoons per fritter) to the pan in batches of 4-5. Cook until golden brown, about 3-4 minutes per side. 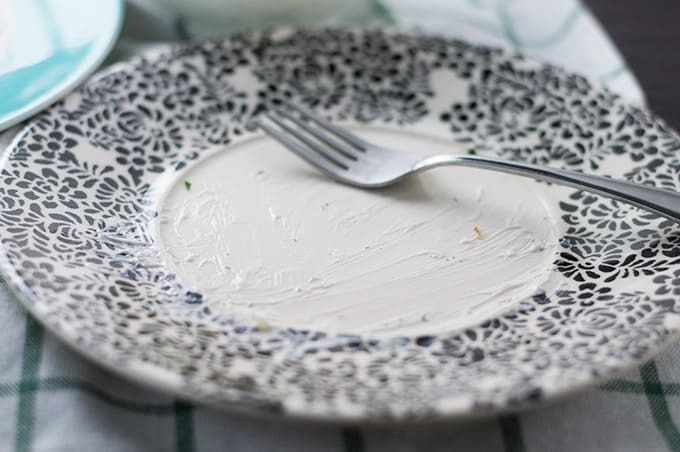 Remove fritters with a slotted spatula or spoon and place on a plate lined with paper towels. Sprinkle with a little more salt if desired. Must be something about the snow and this recipe. Made these tonight because our dinner plans were cancelled due to the snowstorm. 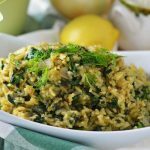 My husband is Greek (but I’m not) and he loved them. Thanks so much for the recipe. Definitely a saver for me.